Our Soft Washing and exterior cleaning services start before our crew even arrives on site. The estimator who looked at your property draws a colored diagram of the areas the crew will clean. Once we’re on scene, we start by unloading our equipment identifying the areas where we will clean. 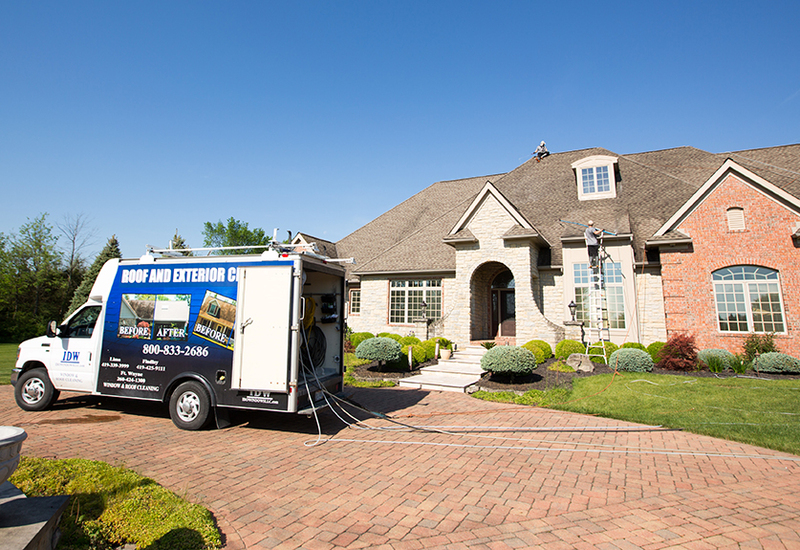 Once the initial setup is complete, we start the exterior cleaning process. If we are cleaning the roof, we start there and work our way downward. This process takes varying levels of time, based on the thickness of algae, which sometimes requires multiple coats of our Soft Wash cleaners. Once the application of the cleaner is complete, our crew moves onto other areas that require cleaning. If you have plants or bushes next to the treated area that need protecting, our crew will spray them with our protective Plant Wash to avoid causing them damage. The treatment plan can vary based on your exterior needs and desires, but can include your roof, siding, concrete, fencing, decks and patios, landscape rocks, and more. Once the Soft Washing process has finished, algae, mildew, and other bacteria is killed and will dissolve. In the case of black stains and algae, you will see a difference immediately. If you have lichen or moss on a roof, the process takes time because these elements have a root system. The cleaners will kill the plant, which will then turn an orangish brown color and eventually fall off after a few heavy rains. We cannot force the moss or lichen off because it could damage the shingles.